So, you have decided you want to get healthy and hire a coach but all you see is personal trainers posting pictures of their biceps etc on social media promoting bodies that are not realistic in today’s modern world unless you spend your life and money on altering your body which can be off putting to the majority who want to start out. Well forget about that as they are in a league of their own. Fitness & health coaches like myself are here to change your life and are here to educate you on how to live a long and sustainable life. I cover everything from fitness, nutrition, stress management, low back pain, diabetes, osteoporosis, and the list goes on. Long gone of the days where coaches are a luxury add on, because in today’s society it has become a necessity however, many are reluctant to spend their hard earned cash on trainers but still spend it on other unnecessary things that lead to many of these illnesses such as boozy weekends, cigarettes, unhealthy foods…..
Whatever your age, fitness, level or body shape, it is never too soon or too late to start thinking about living healthily. You can take a step towards healthy living by making one change now to your daily life. That won’t be so hard will it? Do you wake up with enthusiasm for the day ahead? Do you have the high energy you need to do what you want? Do you laugh? Do you confidently find solutions for the challenges in your life? Do you feel valued and appreciated? Do you appreciate others and let them know it? Do the choices you make every day get you what you want or are your daily lifestyle choices setting you up for illness in later life, or even worse are they impacting your life right now? A healthy lifestyle is one which helps to keep and improve people’s health and well-being. Healthy living is a lifelong effect. The ways to being healthy include healthy eating, physical activities, weight management, and stress management. To help people move forward in a positive manner, improving individuals’ lives in all areas, committed to results and ending failure! Here at Stabilis Fitness my approach is completely holistic – I’m not about helping my clients look like the model in the magazine (the model in the magazine doesn’t even look like that in real life). I focus on your wellbeing and enjoyment. I set achievable goals and make positive lifestyle improvements, motivating and educating my clients to make the right choices. Don’t worry – I make the whole process fun and am often told that my passion and enthusiasm for what I do is contagious! My passion and commitment to help people improve their lifestyle and overall wellbeing can be a force to be reckoned with, but I believe, therefore I achieve such fantastic results and am able to continually drive my clients forward. Whilst most of my clients are local to Colchester, Essex, I do have clients located around the world who utilise my Online Training Programmes to keep them on track. I gained the highest qualification recognised with the Register Of Exercise Professionals, specialising in many areas. As a Health & Fitness Coach with REPs Level 4 status I am able to extend the reach of the business by accepting GP referrals, further helping clients with concerns such as back pain, injury recovery, diabetes and obesity. I am also a consultant in applied nutrition and supplementation helping you get the most out of your nutrition. As an experienced Health & Fitness Coach and using fitness to combat my own health issues, I ensure that each programme and session is tailored to the individual and their own achievable goals. 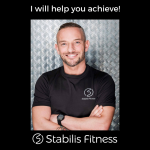 Stabilis Fitness isn’t about quick fixes or short-term targets, but aims to help people overcome barriers, providing mental and physical strength. If you want to know more then why don’t you contact me today for a free consultation to discuss your requirements.